Evolutionary developmental biology (evolution of development or informally, evo-devo) is a field of biology that compares the developmental processes of different organisms to determine the ancestral relationship between them, and to discover how developmental processes evolved (source wikipedia). Conservation and diversification of an ancestral chordate gene regulatory network for dorsoventral patterning. Formation of a dorsoventral axis is a key event in the early development of most animal embryos. It is well established that bone morphogenetic proteins (Bmps) and Wnts are key mediators of dorsoventral patterning in vertebrates. In the cephalochordate amphioxus, genes encoding Bmps and transcription factors downstream of Bmp signaling such as Vent are expressed in patterns reminiscent of those of their vertebrate orthologues. However, the key question is whether the conservation of expression patterns of network constituents implies conservation of functional network interactions, and if so, how an increased functional complexity can evolve. Using heterologous systems, namely by reporter gene assays in mammalian cell lines and by transgenesis in medaka fish, we have compared the gene regulatory network implicated in dorsoventral patterning of the basal chordate amphioxus and vertebrates. We found that Bmp but not canonical Wnt signaling regulates promoters of genes encoding homeodomain proteins AmphiVent1 and AmphiVent2. Furthermore, AmphiVent1 and AmphiVent2 promoters appear to be correctly regulated in the context of a vertebrate embryo. Finally, we show that AmphiVent1 is able to directly repress promoters of AmphiGoosecoid and AmphiChordin genes. 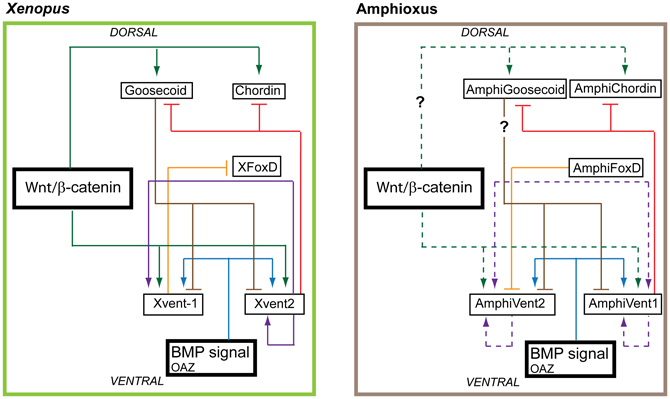 Repression of genes encoding dorsal-specific signaling molecule Chordin and transcription factor Goosecoid by Xenopus and zebrafish Vent genes represents a key regulatory interaction during vertebrate axis formation. Our data indicate high evolutionary conservation of a core Bmp-triggered gene regulatory network for dorsoventral patterning in chordates and suggest that co-option of the canonical Wnt signaling pathway for dorsoventral patterning in vertebrates represents one of the innovations through which an increased morphological complexity of vertebrate embryo is achieved. Gene regulatory network (GRN) architecture for early D/V mesoderm specification in Xenopus and amphioxus. Experimental data suggest high conservation of Bmp-Chordin signaling network in all chordates. In contrast, the role of Wnt/b-catenin signaling in D/V mesoderm specification seems to be limited to vertebrates. Dashed line indicates interactions, that are present in Xenopus but were shown to be absent in Amphioxus GRN (this study). The question mark within the continuous line denotes presumed but not yet proven regulatory link. The question mark within the dashed line denotes likely absence of the regulatory link in amphioxus.